We want to see a change in food production, where technology, sustainable practices and local people come together to create a food system that works for consumers, producers and the environment. We want people to have access to local food and connect with food production at the heart of the city. We think urban agriculture is complementary to peri-urban and rural agriculture, including networks of partners and producers. We promote the role of urban farming as an effective demonstration of circular economy. Our mission is to create sustainable farms which work together with buildings using their energy loss, rainwater, CO2 and natural potential for space, orientation, microclimate and solar exposure. Our farms are circular systems. They are designed to produce no waste, minimise energy input and have a positive environmental impact. Farms are an obvious implementation of circular economy: optimised and aiming at reaching zero waste. In our farms we use cradle-to-cradle and non toxic materials. Tolerance zero for chemicals, antibiotics, GMO results of the transparent nature of Aquaponic farming ecosystem. The bio- filter enables us to produce nutrients for high-quality fruits, vegetables growth and zero waste recirculating aquaculture system. 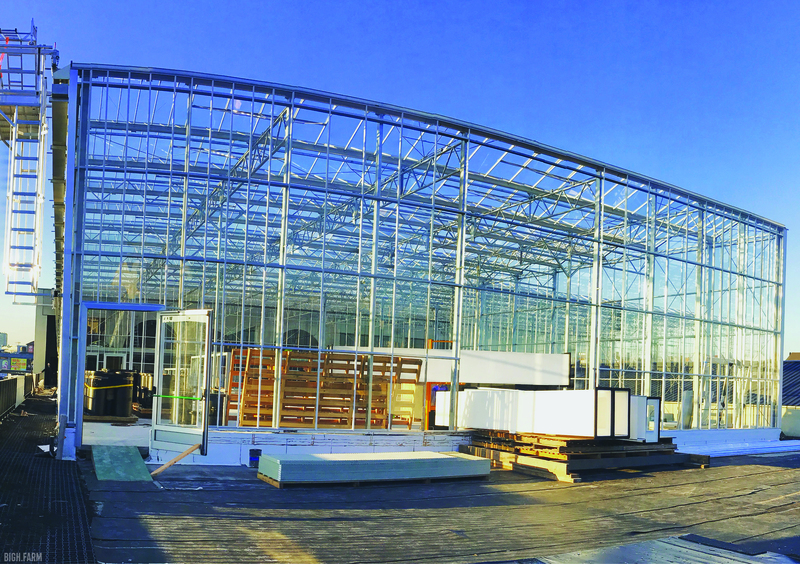 Pioneering Europe’s building integrated intensive and commercial farming model. BIGH is more than ever aware of food quality concerns and bring through short distribution channels, the freshest and tastiest produce to urban dwellers and chefs’ tables. BIGH’s farms also create jobs, generate income & boost green urban entrepreneurship. BIGH works with social workplaces for every farm it develops as well as employs workers from the neighborhood. BIGH was founded in 2015, inspired by Steven Beckers, Cradle-to-Cradle accredited architect and co- founder of Lateral Thinking Factory consultancy supporting for years the implementation of circular economy in the real estate sector. After conducting different studies in 2015 for the Brussels Capital Region on the urban farming potentials, LTFc received many demands for finding operators. Not finding any, it leads to elaborate, with technical support from ECF Farmsystems, a commercial business model based on aquaponics integrated to buildings where buildings support agriculture and vice versa. In 2016, enthusiastic financial partners and technical and commercial collaborators gathered to develop the BIGH model to build the first farm of the BIGH farms network: the Ferme Abattoir. On January 2018, following 4 months of design and permitting supported by ORG architects, 7 months of construction work, the ferme Abattoir was ready for phased operations. End of April 2018, the farm opens officially and will become accessible for public on demand visits while first products will be commercialized from May 2018 in the Brussels Capital region. At BIGH we really believe in Aquaponics, which is why we plan for all our farms to use this production method. Aquaponics is a mixture of hydroponics and aquaculture. Hydroponics is a method of growing plants without using soil, and aquaculture is the practice of farming fish. 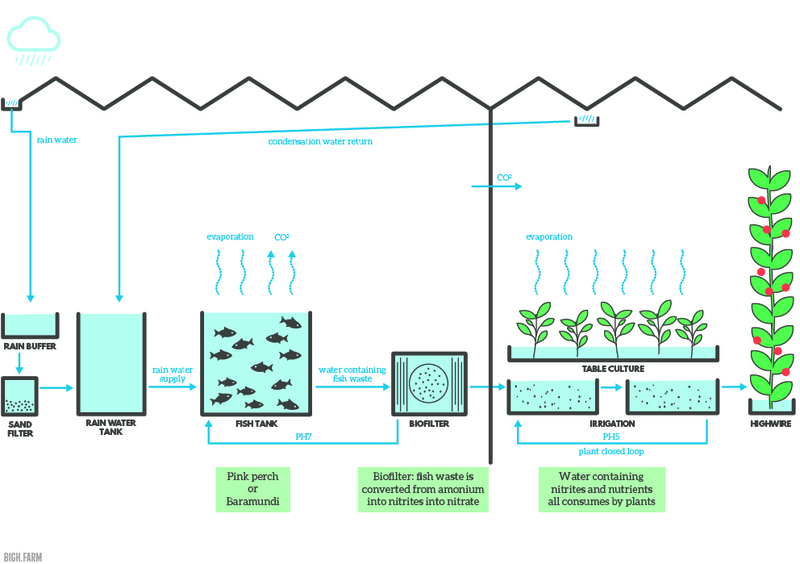 In BIGH aquaponic farms the fish and plants are kept separate, in two closed loop systems. Aquaponics works well because we can turn a waste product into something useful, which means less waste overall. As the fish swim in water it becomes rich in nutrients. This nutrient rich water is then fed to the plants in our greenhouses, which use the nutrients to grow. By using a fish waste product as a fertiliser that means we need to use hardly any additional fertiliser for our specialties! BIGH aims at developing a network of urban farms throughout Europe in synergy with buildings and suitable functions for circular economy synergies with food production. Although one farm is profitable yet a number of farms allows for accelerated development of circular food production. BIGH focuses on urban sites between 2500-3000 m2 production gross area and above. If you are interested in the business development of BIGH, as investor and/or think you might have a suitable site please contact Frank Goes or Steven Beckers using the button below.